I love a great quiche and sometimes can do without the crust. 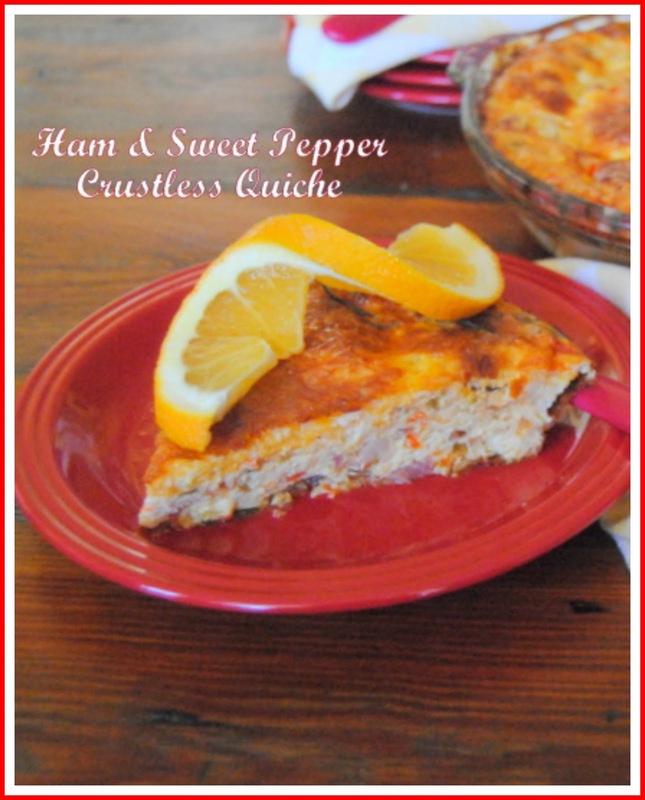 This is a great crustless quiche that is easy to prepare with a delicious flavor. I had a luncheon for a committee meeting the other day and made this quiche. I served it with a simple bowl of homemade tomato soup, lunch was a hit and the ladies loved the quiche. I actually used some of my leftover ham bags from the freezer, with some great sweet peppers, onions and some great seasons, then topped it with some rosemary oranges, it was delicious! In a hot skillet heat the olive oil and 1 tablespoon butter. Stir in the green and red peppers, onions and ham. Saute the mix until the onions are clear and the peppers are clear. Remove from the heat and set aside. In a large bowl, beat the eggs then add the salt, pepper and cayenne. Stir in the half and half and cheese. Stir in the ham and vegetables. Butter the 9 inch baking dish with 1 tablespoon butter, then pour the egg mixture into the baking dish. Bake at 375 degrees for 35 to 40 minutes, until golden brown on top and is set in the center. Remove from heat and cool on the cooling rack for 10 minutes before slicing to serve. Slice fresh oranges and place in a plastic bag, Place rosemary sprigs inside the bag with the oranges and add 1 cup of orange juice. Place in the refrigerator for at least 2 to 3 hours before serving. I sure am glad that you could join us for lunch today, we always have room for one more at the table. Hope you have a fabulous week and come back to see us real soon! This looks and sounds wonderful , Miz Helen! I love a crustless quiche, and make one quite often, cut and freeze the pieces to enjoy for awhile. I'll have to try your version! I love sweet peppers with ham. This looks delicious and easy to do! Thanks for sharing at the What's for Dinner party! I am so glad I found this recipe. I have given up wheat and I love quiche so I just pinned this recipe. I will add it to the menu for next week.